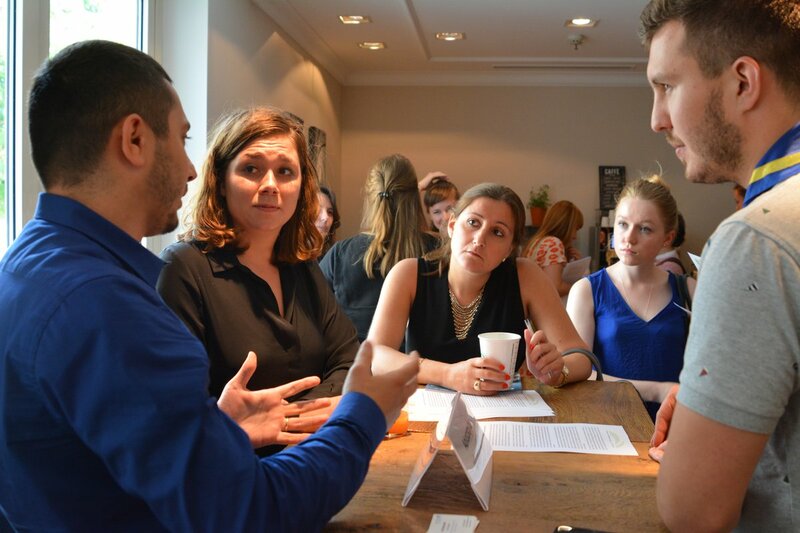 How can youth organisations work with young refugees? On 20 June 2017, World Refugee Day, the European Youth Forum and the Scout Movement organised an event concerning the sharing of good practice for integrating young refugees. Every minute, 22 people are forcibly displaced. The majority of the 65 million refugees worldwide are young people. Abdedllbaset Alheeshan is one of them. He was a logistic team leader in Syria, but in 2015 he had to flee from that country’s war. When he arrived at the special reception centre for refugees in Brussels he had to ‘wait with nothing to do ’. That was when he decided to volunteer in a senior citizens' home to practise his Flemish. He then discovered the Tandem initiative that facilitates refugees who want to volunteer with NGOs. After 2 weeks of voluntary experience with Tandem, he got a placement in the organisation itself. He now has an active role in promoting the integration of refugees into policy-making. Indeed, an idea shared by the speakers at the event “Time to be welcome: youth work and integration of young refugees” was that refugees themselves should be the main actors in integration policies and that the top-down strategy should be ended. Gabriel Almeida, Legal Assistant at the European Council on Refugees and Exiles also pointed out that poor conditions at reception centres, detention policies and lack of respect for fundamental rights by some EU countries have a bad impact on attempts to integrate refugees into society. Carina Autengruber, Vice-President of the European Youth Forum, stated that it was ‘high time for politicians and governments to ditch racist, xenophobic rhetoric and to invest in inclusive, sustainable societies’. She also highlighted the mobilisation of ‘youth organisations across the continent to welcome people fleeing war and persecution’. One such example is the World Organisation of the Scout Movement represented by Andreas Tzekas. Andreas shared his experience as one of the 1500 scouts that volunteered in welcoming refugees who arrived on the Greek coast. ‘For every young refugee that crossed the border there was a young European waiting to welcome them’. He spoke about the project, Time to be welcome, which had 53 volunteers who worked in 4 refugee centres in Greece. An important point for this young Greek was that ‘European volunteers return to their homes as messengers of peace by spreading the new perspective they found by helping refugees’. Tanya Basarab from the Council of Europe-EU Youth Partnership shared her organisation’s research findings on youth work and integrating young refugees into society. Firstly, she emphasised that it is crucial to give support to young refugees as soon as they arrive, given the stress and trauma they would have experienced. A particular issue for refugees is inactivity while they are waiting for a legal answer on their status, which can have a negative impact on their mental health. During this ‘waitinghood’ it is crucial that youth organisations give them a chance to be active and to be heard. She acknowledged that youth workers are assuming roles of humanitarian work and this transition demands new abilities, like dealing with trauma and intercultural skills. Michalis Moschovakos, a policy officer at the European Commission's DG for Education, Youth, Sport and Culture, stressed the importance of the European Solidarity Corps initiative as a way to demonstrate solidarity with refugees. He stated that ‘30 years from now we all will be judged by our stand with this migrant refugee crisis’. Steve Parry from the British Red Cross remembered that of the 588 000 people that arrived in Britain in 2016, only 6.5 % sought asylum. ’We should look for facts and avoid the one-sided tabloid stories that spread negative stereotypes’. This, he said, was the reason why the social campaign #factsnotfear was launched. The European Commission has recently released the 'EU Skills Profile Tool for Third-Country Nationals’, an instrument for non-EU nationals to present their CV in an understandable way for employers. It is available in Arabic, Farsi, Pashto, Sorani, Somali and Tigrinya as well as in all EU languages. The Head of the Council of Europe Liaison Office with the EU, Zoltan Taubner, highlighted the relevance of the Action Plan on Protecting Refugee and Migrant Children in Europe. Youth organisations that want to carry out activities with young refugees can get funding from the Erasmus + Programme and the European Youth Foundation. Information papers can be also found on the website of the Journeys to a New Life conference.